With a large storage space option, a spacious cable management system, a wide range of specifications and finishes available, the Champion desk is perfect for the needs of children and teenagers. The patented Comfort system allows seamless height adjustment without any effort. The complementary colour applications allow the Champion desk to be adapted to the children’s room whenever they change trends. Furniture should contribute to the quality of life in one’s home and create a certain amount of warmth as well as make the space inviting. Inspired by the concept that a children’s desk should be modern and elegant whilst still providing good practicality and ergonomics, Moll Champion desks prove that a designer desk has a place in the kids’ room. The Moll Champion front up children’s desk has set new standards and has been honoured with several awards based on its design, quality and functionality. The Champion desk has moved away from traditional office furniture looks with its smooth design and natural styling, showing off its high-quality craftsmanship and optimal adaptability. The front part of the table top can be tilt adjusted for reading and writing, while the back of the table can serve as a shelf and work surface. The tilting worktop can be adjusted via its two pull buttons at the front of the table; the left button lifts the worktop and the right button lowers it, leaving no obstructive gaps when flat. This ensures that the child is at a good upright, ergonomic posture when studying. The pulley mechanism is childproof and TÜV approved. The Comfort height adjustment works on a patented yo-yo cable pull mechanism that is located at the foot of the desk. By simply pulling on the cable, the height of the table can be synchronously adjusted without any effort. The yo-yo mechanism can be mounted on the left or right of the table to allow flexibility and can be removed for safekeeping. The cable pull can be covered with the supplied colour caps. 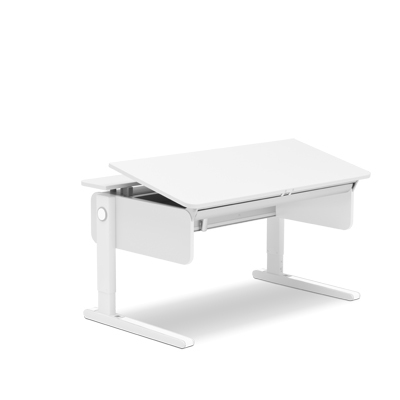 The height range of the desk can be adjusted from 53 cm to 82 cm to suit children of 120 cm to 200 cm. Moll has developed colour applications that are supplied with the kids’ desk and are interchangeable at any time to stay up to date with the children’s taste. To allow even more creativity, the width and depth of the table can also be expanded and adapted to extend desktop surface and storage. These accessories can be retrofitted at any time. The Moll Champion not only impresses with its sophisticated functions and ergonomics but also with its slim and futuristic design. The Champion desk was awarded the Red Dot Design Award and the German Design Award in 2018. Champion front-up with undivided table top with fixed rear shelf. Regardless of which model is chosen, the desk will always be ergonomic. Our recommendation: left-up for right-handed, right-up for left-handed, front-up suitable for everyone. 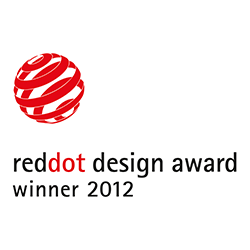 Winner of the prestigious RED DOT Design Award 2012. 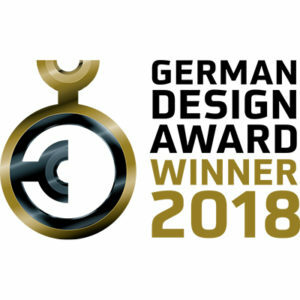 Winner of the renowned German Design Award 2018.